Sharda Cropchem Limited is engaged in the marketing and distribution of a wide range of formulations and generic active ingredients globally. It's core strength lies in identifying generic molecules, preparing dossiers, seeking registrations, marketing and distributing formulations or generic active ingredients in fungicide, herbicide and insecticide segments. The company has also recently entered into the biocide segment and has acquired several registrations from the existing registration holders, primarily, in Europe. As of August 5, 2014, the company has over 180 Good Laboratory Practices ("GLP") certified dossiers and as of July 15, 2014, the company owns over 1040 registrations for formulations and over 155 registrations for generic active ingredients across Europe, NAFTA, Latin America and Rest of the world. "The company procures formulations and generic active ingredients in their finished form from third party manufacturers for onward sale. It also procures generic active ingredients for preparation and sale of formulations wherein it outsources the process of preparation of formulations to third party formulators. 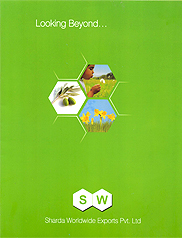 This enables the company to offer diversified range of formulations and generic active ingredients in fungicide, herbicide and insecticide segments for protecting different kind of crops as well as serve turf and specialty markets and in biocide segment as disinfectants, thereby catering to varied market demand."